The greenbelt land North Charleston plans to sell sits behind the Rhett Park trailer home property, where a 51-townhouse development is proposed. The trailer park entrance on South Rhett Avenue in 2016. 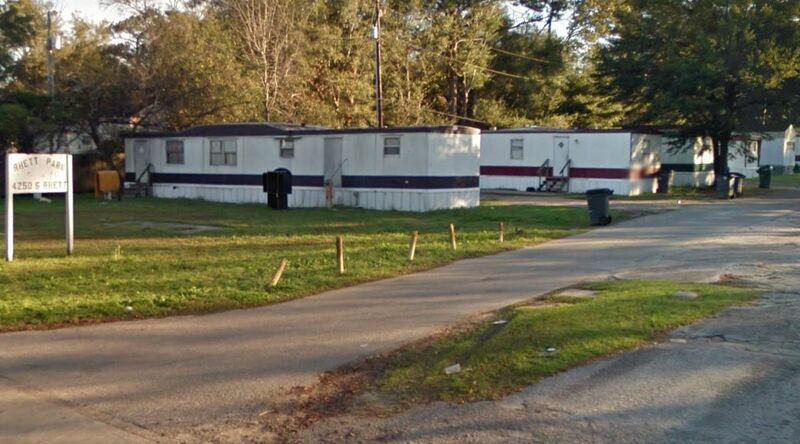 Provided/Google Street View. For the first time, a Charleston County property that was purchased with greenbelt funds is slated for sale to a private developer. North Charleston plans to sell the 1.2-acre vacant property at the end of Rome Lane for $160,000 — eight times what the city paid in 2011 — with the funds going back in to the city's pool of greenbelt money. “This was one piece that we bought quick and never really had a plan for it," said Shannon Praete, North Charleston's grant administrator. The city took advantage of low prices during the recession to acquire a number of properties using greenbelt and city funds. The property on Rome Lane, which was called Aragon Street at the time, was among them. The Rome Lane property's neighbors are a freight rail line, a Spruill Avenue ice distribution business, a South Rhett Avenue trailer park and a formerly city-owned property where Firefly Distillery plans to build new operations. Praete said the buyer, Rhett RD LLC, wants the land for part of a townhouse development that's planned on the site of Rhett Park trailer park. “This property was just the back half of it," she said. "They need it for turnaround for firetrucks and sanitation." Charleston County Greenbelt Programs Director Cathy Ruff said this is the first time an entire greenbelt property has been sold. “The only time (greenbelt land has been sold previously) is when we’ve had the Department of Transportation or SCE&G buy right of way," Ruff said. "It’s been minimal amounts of money." In those cases, only portions of the land were sold, she said. Some entire greenbelt properties have been transferred between government and nonprofit organizations, such as The Nature Conservancy transferring land to the U.S. Forest Service, but those properties remained as protected space. "The ordinance does allow it," she said. “They (North Charleston) either have to replace it with like land, at current fair market value, or pay the money back." In the end, North Charleston could turn its original $20,000 of greenbelt funding into $160,000. The Greenbelt Advisory Board and Charleston County Council would need to approve the deal, as would North Charleston City Council, at a meeting Thursday. Mayor Keith Summey said at a committee meeting March 21 that this land deal has been in discussion since 2017. "This is a property we agreed to sell a year and a half ago," Summey said at the City Council Finance Committee meeting. Charleston County's greenbelt program began in 2004 when voters approved a half-cent increase in the sales tax intended to raise $1.3 billion over 25 years for roads, protection of green space and mass transit. Greenbelt programs were to receive 17 percent of the funding. Voters approved a second half-cent sales tax in 2016, pumping more money into Charleston County road plans, mass transit and green space. The Greenbelt Advisory Board is preparing to review in April the first proposed purchases under that round of funding. The Charleston County Greenbelt Program wasn’t set up to fund speculative real estate investment.